Parents: Does your teen withdraw to his or her room at every opportunity? Does she talk with you about her friends? Does he participate in discussions at meals? Does your teen want you to see projects from school? When is the last time you actually went into your teen’s room and looked at what’s hanging on the walls and sitting on the shelves? Teens: Do your parents hide behind the newspaper? Do they always have to work when you’ve got a game, a recital, or an open house at school? Is there anything you do together anymore? When was the last time they took a walk, a bike ride, or even a trip to get ice cream with you? When did that sudden gap divide your home into territories staked and claimed, with music blasting through the halls and fists banging on doors to turn down the stereo/TV/video game? Teens, when did you start seeing your parents as your enemies instead of your heroes? And parents, when did you start seeing your teens as crazy little demons instead of your loving children? Finally, there is a solution for both sides, and one that will not only bridge that gap but show parents and teens alike how to prevent it. 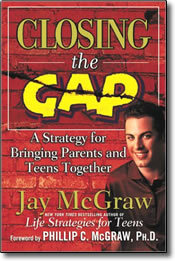 Jay McGraw is the ideal person to write a book for both parents and teens. A bestselling author by the age of twenty-one and son of number one New York Times bestseller Phillip C. McGraw, Ph.D., known to millions worldwide as Dr. Phil, Jay has seen the parent-teen battle from all angles. In this groundbreaking work, he introduces a new plan for both teens and their parents to work through the issues that divide them and, in the process, rediscover the love that initially defined their relationship. Jay works from both sides — sharing the perspectives of parent and teen as the former struggles for control, the latter for independence. He explains to parents how their teenagers wish to be treated, cared for, and even disciplined, and he shows teens how gaining power can come only from earning respect. In finding a common ground and, even more important, a common respect for each other, parents and teens can break down the walls, unlock the doors, and welcome each other back into one another’s lives again.